I’m in love! Of course I used lots of mod podge and scrapbook paper. By the way… this image from the VERY talented Brassy Apple was my inspiration:: Please click on the picture to go see what she did… amazing! I have MANY more makeover projects up my sleeve…. stay tuned! WOW!! I love it!! You are so creative!! Thanks for sharing!! Love reading your stuff – you are funny. g.a.s.p.! that is WOW! love it. Yours looks amazing. Great job. You must feel so proud walking past it and admiring its beauty. Love it! You did great on the dresser! My mom would be so proud of you for picking it up off the street….she’s the queen of finding treasures on the side of the road! Funky and cool! I love it. Oh, that is just way too adorable! 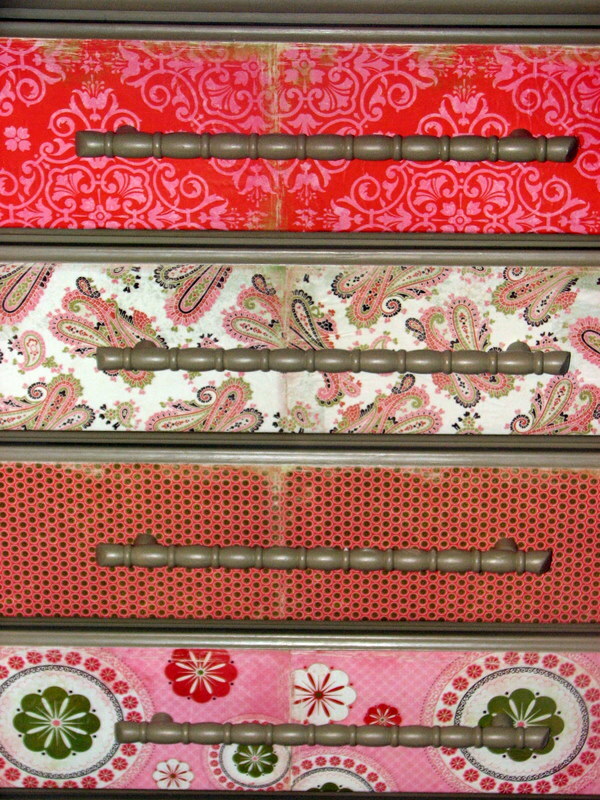 What a wonderful idea…love the mixture of patterns, makes it even better! Love it! I keep saying I want to do something similar (especially after seeing photos like that) and then I never do. Yours turned out so pretty though! Awesome! So cool… i need you to find me treasures! Great job and fabulous transformation! I LOVE THIS!!! Wow. Where are you in OK? I am from Tulsa but in FL now. Looks awesome!! Way to rescue that dresser. I LOVE LOVE LOVE This!!!! I’m thinking you need to open your own craft shop. You make some awesome stuff! Well hello there sweet Suzanne! I absolutely am floored with what you did to the dresser! How fabulous is that! I really like the scrapbook paper you used for it and the distressed edges. Perfect! Thank you for sharing this inspiration. Oh my gosh! So So cute! 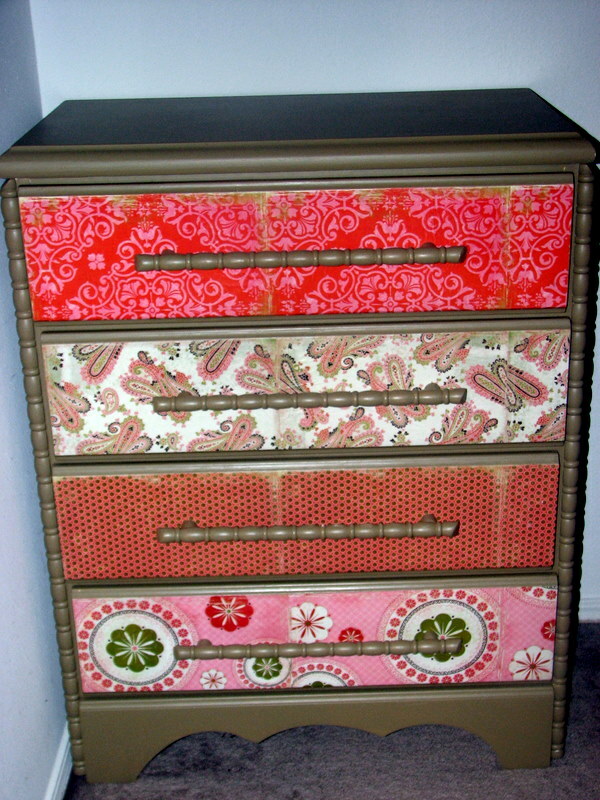 My last post on my blog was actually a dresser that I did the same thing too! And i’ve done a desk as well all because of that same inspiration photo! Love it! How great is that?? You did an absolutely wonderful job. Oh Suzanne, you did such a good job on the dresser! It is so cute!!! I bet you had lots of fun doing it! I love it when trash is made into a treasure!!! Your blog is hilarious with the description ” roadkill”! I am looking forward to seeing your next project! Awesome!!!! You are so talented. Oh my gosh….I love it! Nice job. Thank you all so much! Becca, just let me know… I’ll help you w/ it! Suzanne, I love it! You did a great job! I’m so in to crafting lately….this is really inspiring me! Thanks! Great job on the dresser!!! I am wanting to do another one too!!! I love my desk that I did last year! Hello? Super funkadelic-psycholicious. LOVE LOVE LOVE it!